Confit, pronounced con-fee, is a French term for foods that have been immersed in a substance to preserve the food and to enhance its flavor. There are two main types of confit, which can be created from a variety of foods. The word confit comes from the French word "confire", which means "to preserve". The very first foods cooked in confit were fruits, which were cooked and preserved in sugar during medieval times. 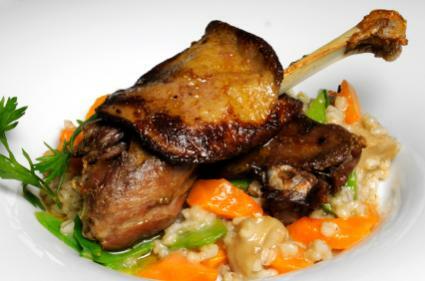 Today, confit can be used to preserve fruits in the same way, but it is more often used to impart flavor and texture to foods such as duck, goose and other meats. Meat confit is typically used on waterfowl - ducks or geese - and typically refers to the leg of the bird. The meat is seasoned and salted before being refrigerated for 24 to 36 hours to help preserve it. The salted meat is then rinsed, patted dry and placed in a dish filled with the rendered fat from the bird. The fatted meat is cooked slowly, up to four hours, to allow the fat to impart flavor and a tender texture to the meat. Once cooked, the confit can be refrigerated in a tightly sealed container for up to six months. While true confit is made of waterfowl and is referred to as "duck confit" or "goose confit", other meats can be given the same treatment by cooking them in rendered duck or goose fat. Cooking a cut of meat other than waterfowl in this way is referred to as "en confit". The fat which the confit is stored in can be a wonderful way to impart flavor to other foods during the cooking process. It is not uncommon to grill or fry the meat in a small amount of the fat while the rest of the fat is used to sauté the vegetables being served with the meal. Keep in mind that the salting process used in making the confit gives the meat a very salty taste. Therefore, always serve confit with a sweet tasting sauce, garnish or side dish to help counteract the saltiness. Confit is still used to preserve and candy fruits in sugar or honey. The result often has the consistency of jam or preserves, although whole fruits can be candied in this manner as well. To make a fruit confit, slices of fruit, juice and citrus rind are placed in a pot along with spices, white or brown sugar, honey, cider vinegar and water. The mixture is boiled until it thickens, and then transferred into jars. Small pieces of fruit can be infused with sugar quickly, making them easier to use. Larger pieces of fruit are more difficult to infuse properly, because they must remain submerged in the liquids and sugar until the sugar reaches their cores. 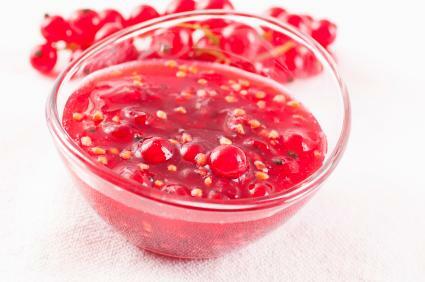 Fruit confit can be used as a topping or sauce for savory meat dishes. Some vegetables like tomatoes or onions can also be cooked in this manner to make a sweet and tart side dish. Slices of lemon or lemon peel that have been turned into a fruit confit make excellent cake toppers and decorations for other desserts. The preserves are best eaten as an accompaniment to a larger, more complex dish. Because confit properly stored can last for months at a time and can be used to flavor so many other dishes, it makes a wonderful gift for food lovers and chefs alike. Create a duck or fruit confit to give as a gift, or look for a confit at some high-end food retailers. The texture, flavor and consistency will enhance nearly anything they are served with.